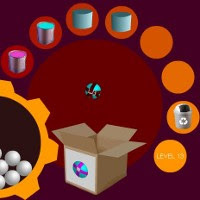 Factory Balls 2, by Bart Bonte of Bonte Games, is a fun, mind-bending experience, in which your objective is to create different “balls” of varying physical properties, using a predetermined range of tools. First off – it’s quite a bit more fun than it sounds. You’ll begin with a tumbling kitty of blank balls, each of which is meant to serve as a sort of “physical canvas” you’ll need to manipulate to achieve an assigned result. A picture of the final product you need to create is displayed on a small packing box, and once you’ve created an exact likeness, your creation is automatically packed up and shipped. The game starts off easy, and the first puzzles only require a few steps to complete. Things will ramp up quickly, however, making occasional experimentation necessary. Your goals (and tools) will get pretty strange as you progress. After a while, I even started to wonder how the factory stays in business (given the troubled economy and the relative uselessness of the products). Factory Balls 2 is a pretty lengthy experience containing thirty levels that should keep you puzzling for a while. The game will also save your progress when you complete a level. That’s a good thing, because although the game is long enough you might not want to finish it in one sitting, the linear puzzle progression doesn’t lend itself to much replay value. Overall, Factory Balls 2 is a fun, logical, and challenging game. Its relaxing pace combines well with the trickier puzzles, and makes the game well-worth checking out.